Initially on course to storm theaters in July, late last year Sony confirmed plans to reshuffle its release slate, resulting in new dates for both Jumanji and Edgar Wright’s music-fuelled heist movie Baby Driver. 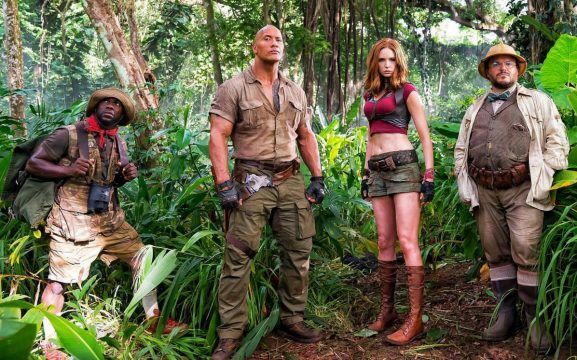 But now that we have our first look at the latter, it won’t be too much longer before the studio lifts the lid on the former, after Dwayne Johnson confirmed via Instagram that the first Jumanji trailer will be screened for those in attendance at this month’s CinemaCon 2017. Due to take place in Las Vegas, Nevada from March 27th through to March 30th, the annual showcase is typically viewed as the smaller cousin to the mainline Comic Con events across New York and San Diego. But with a record ten participating studios booked in for 2017’s event – Sony included – those attending CinemaCon 2017 can look forward to plenty of surprises along the way. Also starring Madison Iseman, Rhys Darby, and Morgan Turner, Jumanji is earmarked for release on December 22nd. Other Hollywood tentpoles slated for the same window include Pitch Perfect 3 and Star Wars: The Last Jedi. No pressure, then.